Under Volkswagen’s ownership Bentley unveiled the first ever Continental GT in 2003. 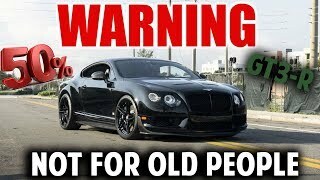 For coming around 8 years it received numerous modifications and special editions till the second generation model made its way in 2013 with a more powerful engine beneath its hood and finally here we are with the all new Bentley Continental GT3-R 2015 with revised interior and exterior and amazing sprint capability, matching to that in Ferrari. 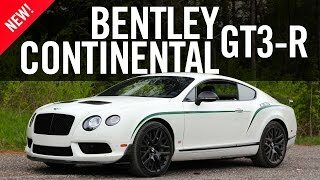 Let us have a close look at the review of Bentley Continental GT3-R 2015 and find out all the new stuffs incorporated to make it better than its predecessors. Interior of Bentley Continental GT3-R 2015 is no way behind in luxury despite its sporty exterior and powerful engine. Keeping the legacy of its name Bentley has amalgamated best in the luxury amenities, keeping the touch of sportiness. The queue begins with new sports seats with foam layers and updated bolstering. Adding class to it is Beluga black leather trimming accompanied with Alcantara in diamond-quilted format. Alcantara further spreads its wings and leaves a remarkable touch over the steering wheel and gear shifter. Apart from soft luxurious-looking materials the interior of Bentley Continental GT3-R 2015 also features lot of carbon-fiber, primarily over parts of dashboard, center console and door casings. Rounding up the entire interior and giving it a unique look is a shade of green all across the black cabin and contrast stitching over sports seats. Exterior of Bentley Continental GT3-R 2015 is your bridge between the racing GT3 and your dream aggressive coupe. 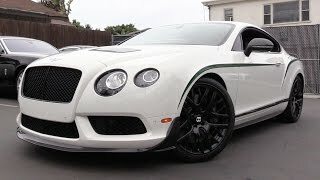 Starting with the front fascia of Bentley Continental GT3-R 2015 you’ll notice a redesign over bumper and hood, while the lower front comes with three air intakes delivering fresh air to brakes and engine. Bentley has also introduced a carbon fiber splitter to make Bentley Continental GT3-R 2015 aerodynamically efficient. Moving towards the rear fascia of Bentley Continental GT3-R you have a massive rear-wing and a spoiler glued down below adjoining ground while the bumper comes integrated with dual-exhaust system. Getting more powerful with its total output, Bentley Continental GT3-R 2015 comes housed with a 4.0 Liter twin-turbo V8 engine generating total output of 572 hp and peak torque of 700 nm paired to ZF eight-speed automatic Quickshift transmission with paddle shifters mounted behind the steering wheel. 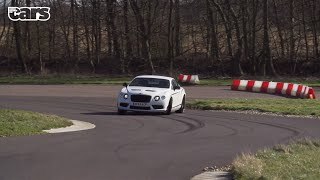 With its throbbing power rotating the wheels, Bentley Continental GT3-R is capable of knocking 0-60 mph sprint in just 3.6 seconds while the top speed touches a 170 mph mark.